As high season approaches in Chiang Mai, the latest edition of Thailand’s gay magazine, Thai Puan has an informative article on the gay scene in Chiang Mai and the up-coming high season. It includes information about Loy Krathong which this year is from 21-23 November. You can read the November issue of Thai Puan online below or at thaipuan.com. 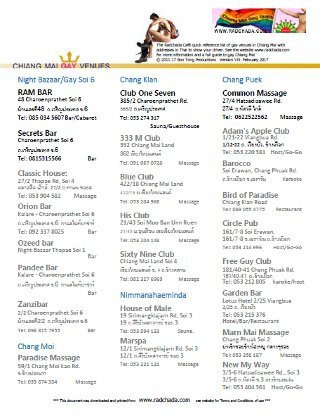 ALternatively, pick up your free hardcopy in any of Chiang Mai’s gay bars.